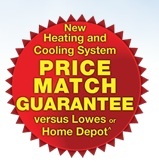 Stay warm this Winter and cool this Summer with a new heating and cooling system from Sears! Get a Kenmore® Heating and Cooling replacement system installed:* from Sears now with No interest financing for 18 months. Click the ad below for details.